So I've come to the end of my trip, and I have one last lunch in the city before heading off to the airport. I've saved this meal for another very specific type of Japanese cuisine - eel (うなぎ). And once again I turned to the touristy Michelin Guide for help. Nodaiwa (野田岩) is a chain with several locations in the city, and even has a branch in Paris! Although the Ginza (銀座) branch is within walking distance from my hotel, it was closed today due to the national holiday. Fortunately the honten (本店) - a stone's throw away from Tokyo Tower and with a Michelin star to its name - was open today. I wasn't able to make a reservation as a solo diner, so I showed up at the door of the traditional gassho-zukuri (合掌造り) house - which was transplanted from Hida Takayama (飛騨高山) and rebuilt on this spot - as a walk-in. I put my name down on the waiting list, and patiently waited inside next to the hibachi (火鉢). Thankfully I only waited for about 15 minutes before my name was called, and I was led around the corner to the annex (別館). 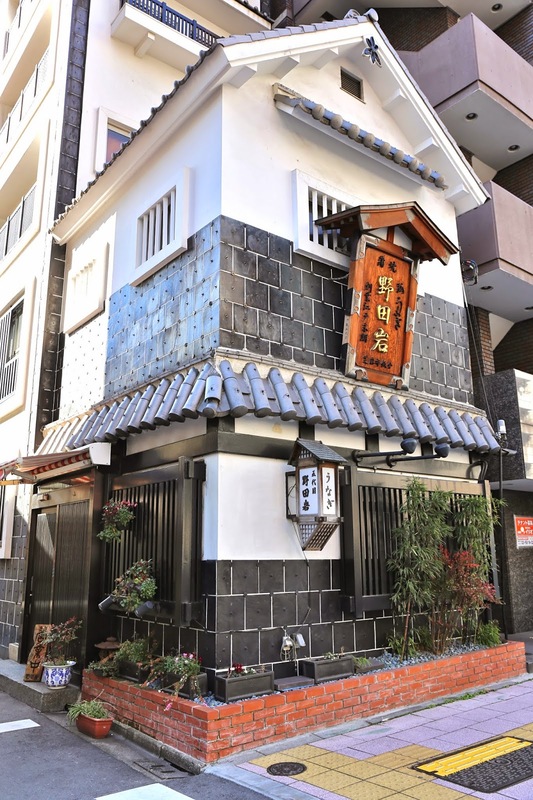 In spite of its history dating back more than 200 years, and being taken over by the sixth generation (六代目), Nodaiwa is actually pretty modern in terms of the menu. They've created wine pairings for their eel, and they've also incorporated caviar into some of the dishes. But today I decided to take the middle road and just have something straightforward - and took one of the sets that gave me a good "overview" of what they do here - the "three delights of eel set (鰻三楽コース)". Unfortunately I came during the wrong season, so they're not serving wild-caught eels today, and I'm getting farmed eel instead. Eel jelly (鰻の煮こごり) - my set only comes with one type of appetizer (お通し), and these cubes of jelly were very delicious. Shirayaki (志ら焼) - this is Nodaiwa's signature way of serving eel. The eel is steamed and grilled without being drenched in sauce, and the eel is taken with a pinch of wasabi and a pinch of salt. This allows the natural flavors of the eel to shine. Next came the unaju (鰻重), along with the usual accompaniments such as pickles and grated radish. For this part, the eel was grilled with the traditional sauce. Very, very delish. What's even better is that Nodaiwa uses the same sansho (山椒) pepper from Hida (飛騨) that I absolutely love. I've already bought a few little tins from another shop, and I decided to buy a couple more bags of it since it's on sale here. Just loooove that kick and that citrus, almost lemongrass-like flavor. Finally, there's also a bowl of clear soup with eel liver (肝吸). I love grilled eel, and this was definitely the best eel I remember having in Japan. There are, of course, plenty of old shops with long histories of serving eel, and I'll just have to slowly make my way around to more of them... For today, I'm just thankful that I had the opportunity to try this historical restaurant.